Botanical definition: Fiber = long narrow tapering cell, dead and hollow at maturity, thick cell wall composed mostly of cellulose and lignin, rigid, for support, found mainly in vascular tissue. II. Types of plant fibers used in commerce; may be single cells or groups of cells. Soft or bast fibers are found in the phloem (inner bark) of dicotyledonous stems (flax for linen; jute; hemp; ramie). Hard or leaf fibers are found in monocot leaf vascular bundles (sisal, Manila hemp, pineapple). B. Papermaking fibers are single cells of cotton or delignified wood. Gossypium herbaceum from S. Africa and G. arboreum from India, both independently domesticated, especially India, spread to Arabia, Europe. Both are diploid species, have short staple (fiber). G. hirsutum upland cotton, domesticated in Central America, predominant cotton grown today, long staple, tetraploid hybrid of wild South American diploid species and Old World G. herbaceum. 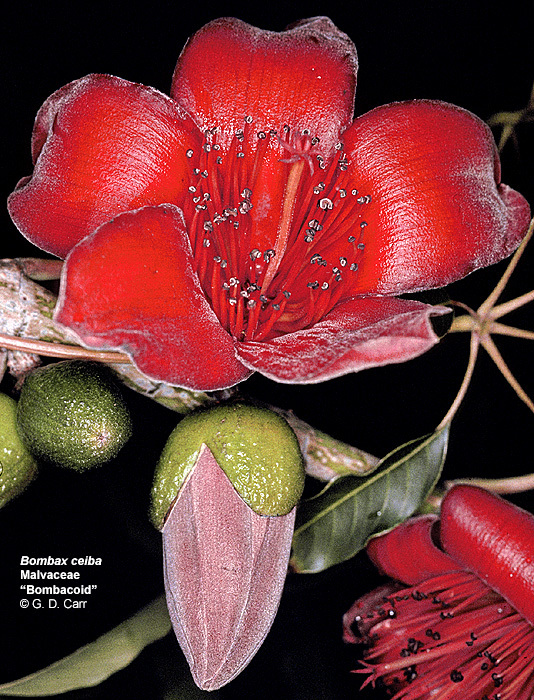 G. barbadense, Sea Island, pima, or Egyptian cotton, domesticated in Andes, spread early to Caribbean, also long staple, tetraploid hybrid of New World and Old World diploid species. Eli Whitney invented the cotton gin in 1792, separated lint from seeds. This made possible the plantation economy of U.S. South based on cotton and slave labor, and was a key element in the industrial Revolution.. Cotton dust can be a hazard. Cotton seed is pressed for cooking oil, and the residue, cottonseed oil meal, is used for animal feed. Cotton lint from bales is carded (straightened), combed, bleached. Spinning of lint while stretching binds individual fibers into yarn or thread; depends on the natural twist in cotton fibers. Thread then woven into cloth. Cotton is a major agricultural commodity in the United States and much of the world. Widely cultivated in China, Uzbekistan/Turkmenista, India, Pakistan. French West Africa, Brazil and Australia -- all of whom export cotton to the United States. Used in prehistoric times in Swiss lake dwellings, many sites in Near East. Especially cultivated in Egypt, then Greece, Rome. Later centers of production in Belgium and Ireland. Now mainly grown in China, former USSR republics, W. Europe. Linen, Linum, lingerie, line all derived from same root word. Flax grows in cool climates, to height of 4 ft; unbranched varieties for fiber, branched for oilseed. Flax is harvested by combine that separates seed head, then pulls up stem from ground. Processing: [REQUIRED READING], also here. Retting = rotting for 1-2 weeks on ground, or days in water; removes soft tissue, leaves vascular bundles. Breaking = pounding or rolling, frees fibers; scutching = scraping off particles; hackling = combing; then spinning, bleaching, weaving. Ramie [REQUIRED READING] (Boehmeria nivea): native of China, grows 6 ft high, longest fibers, processed like flax. Used mostly with other fibers for sweaters, knitwear. Relatively inexpensive. Hemp (Cannabis sativa), different varieties than drug plant. Native of China, processed like flax [see pictures of the production process]; comes in a variety of forms and textures; used for canvas, rope and paper. Hemp cloth made in Nimes, France = denim; in Genoa, Italy, for jeans. Original Levi jeans were hemp, now cotton. However, clothes are still made of hemp. 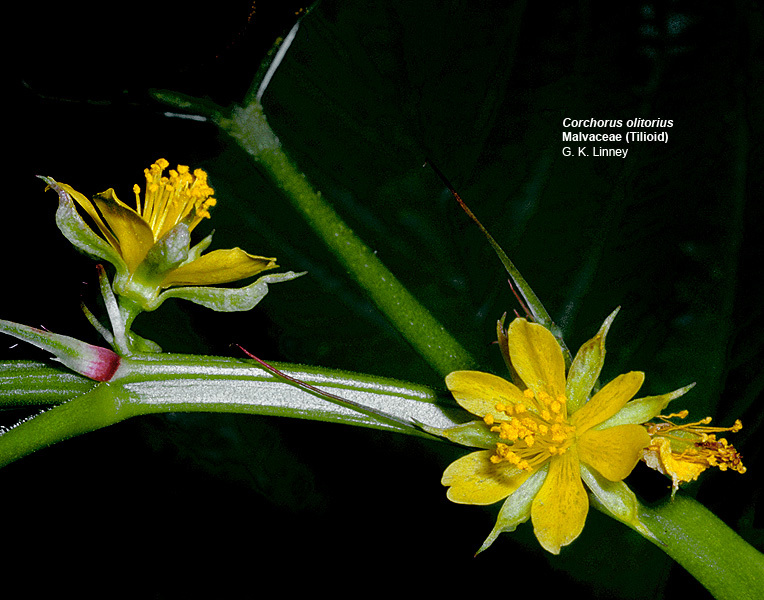 Jute (Corchorus spp. ), native of India and Bangladesh, processed like flax, used to make burlap, carpet backing, rope. Main export crop of Bangladesh; India is a major producer as well. Kapok (Ceiba pentandra), seed fiber of South American tree; fibers are hollow and waterproof, used for life preservers, parkas. Oil is also produced from the seeds. Rayon, a synthetic fiber from viscose, a chemical derivative of cellulose from wood pulp. Cellophane is chemically identical but made into sheets instead of fibers. Wood pulp = slurry of water and separated wood fibers. Paper = thin sheet made by spreading pulp on a screen, draining and drying it. Mechanical grinding, makes cheapest pulp and paper, brown color if not bleached, yellows readily. Used for newsprint, catalogs, paper towels. Papermaking consists of allowing pulp to flow onto a moving screen, where the forming paper is quickly drained, then pressed and dried. Dry paper can then be sized = treated with starch or clay to fill holes, make smooth surface. "Fiber Wars: The Extinction of Kentucky Hemp" by David P. West, a major review and well worth reading!! Loose definitions: Herbs are aromatic leaves, spices are other aromatic plant organs (stems, fruits, seeds, roots, bark). Essential oils are flavor and aroma components, often used instead of whole plant parts. Herbs and spices are used in cooking; spices also for perfumery, dyeing, medicine, preserving food (originally embalming, in ancient Egypt). Black Pepper (Piper nigrum), cinnamon, ginger (Zingiber officinale) imported by Greeks from India, through Arab traders. Romans sent ships direct from Red Sea ports. Greeks had many local herbs. Trade monopoly by Arabs and Venetians, 1200s. Age of Exploration: Monopolies established sequentially by Portuguese, Dutch, British and French, importing spices from the East. Monopolies gradually broken by war, smuggling of plants to new plantations. New World spices imported to Europe by Spanish; never had the importance of Old World spices. Cinnamon (Cinnamonium zeylanicum), inner bark of cinnamon tree, India; closely related cassia, traded as cinnamon in U.S.
Black pepper, fermented and dried berries of pepper vine, India and East Indies. White pepper = same fruit with black outer portion removed. Ginger, fresh or dried rhizome of monocot herb. Turmeric (Curcuma longa), dried rhizome, related to ginger, used in curry powder, prepared mustard, for yellow dye. Cloves (Eugenia caryophyllus), dried flower buds of small evergreen tree from Spice Islands, East Indies. Nutmeg and mace, from nutmeg tree, from Spice Islands, East Indies. Mace (Myristica fragrans) is dried aril, a red netlike tissue covering the pit of the fruit. Nutmeg is the dried seed in the pit. Chili peppers (Capsicum spp. ): fruits of herbaceous plants from Mexico, C. and S. America discovered by Columbus [REQUIRED READING - introduction, origin and exploitation only]. Hot compound is capsaicin, also used as painkiller, as for example the drug Zostrix used for arthritis. Many varieties, shapes, sizes, pungency. Commonly made into chili powder. Modern bell pepper is a chili that lost its hot. Vanilla (Vanilla planifolia), fermented and dried fruit of an orchid from Mexico, called vanilla bean. Allspice (Pimenta dioica), dried fruits of Caribbean tree; so named because it tastes like combination of cinamon, cloves, nutmeg. Mint family, most from Mediterranean: peppermint, spearmint (Mentha spp. ), basil (Ocimum basilicum), thyme, oregano, marjoram (Origanum majorana), rosemary (Rosmarinus officinalis), sage (Salvia officinalis). Leaves are used. Parsley family, mostly Mediterranean, leaves and dried fruits: parsley (Petroselinum crispum), dill (Anethum graveolens), caraway (Carum carvi), cilantro, chervil (Anthriscus cerefolium), coriander (Coriandrum sativum), anise (Pimpinella anisum), cumin (Cuminum cyminum), celery (Apium graveolens), fennel (Foeniculum vulgare). Mustard family, Old World: white, brown, and black mustard seeds (Brassica juncea) (yellow is from turmeric), horseradish root (Armoracia lapathifolia), Japanese wasabi. Lily family: onion (Allium cepa), shallots (Allium cepa), leeks (Allium tricoccum), garlic (Allium stativum) (all bulbs), chives (leaves).